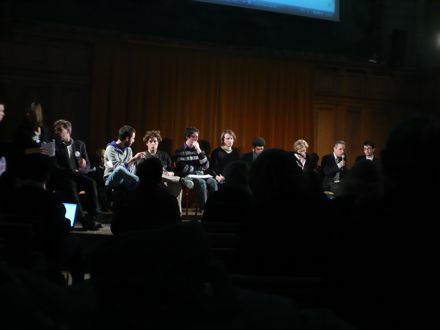 Last month I went to a debate organized at the Sorbonne, “Is the university burning?” (L’Université brûle-t-elle ?) Appropriately, it ended in chaos; but midway through, there was a bit of performance art. Let us burn the university! No! The University is not for profit! It is there to create more freedom, more riches (that are not material), “Latin is useless and that’s why it’s beautiful!” against the death of “dead languages”, let us burn the university! In the name of all erasmus students, I would like to say I had no time to write a speech, because I work to pay my way and so we say “let us burn the university”! The more serious debate went on with a panel discussion. 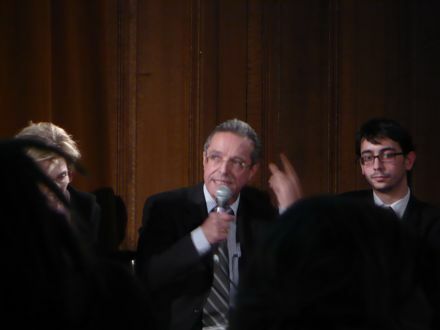 However, among the panelists was the university president. And every time he opened his mouth to speak, people in the audience booed and hissed. He waited for them to finish; the moderator made failed pleas for civility; he spoke some more; his face became agitated. In essence, his speech was a failure, blocked by the crowd. “By anarchists,” someone claimed later. He didn’t stay to the end of the debate, leaving by the side door soon after his (interrupted) speech had come to an end. And this has indeed been one of the common remarks about last spring’s university protests: that traditional protest forms (i.e., street marches) seem ineffective against a government that can simply ignore them. 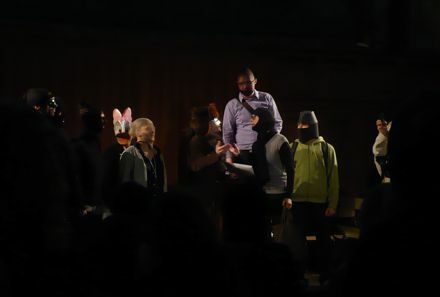 Now looking back up into the auditorium, we can see one of the protestors standing up. He was shouting about the undemocratic format of the event and about how the voice of the audience had been excluded. The original format dictated that panelists spoke first, followed by “invited” audience comments, and finally general comments. That fell apart when the “general” audience wanted to speak sooner: after the speech you see pictured here, the event never returned to the sedate form of a well-groomed public event. Rather it hissed permanently with the noise of loud conversations among the audience, it hissed with interruption, it hissed with anger and incoherence. Incidentally, it doesn’t look like such a large crowd in this photo, but there may have been a couple of hundred people there all told. We cannot simply talk about politics, we must act! It is a matter of respect not to insult others during the debate; we’ve gotten results at the end of six weeks of occupation of our university. The presidents of the university and of the region were obliged to negotiate with us. I’ve been surprised to see that this debate has been so philosophically oriented… and not adequately pragmatic. We’ve come a very long distance to bring you ideas and not to talk about philo[sophy]! Let’s move on! Since I’m interested in the relationship between philosophy and politics, this last remark interests me. 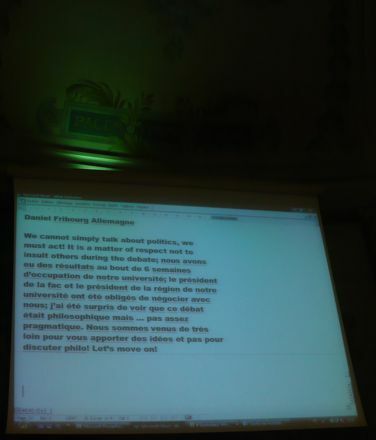 It seems to say: philosophical discussions are antipolitics. Philosophy discussions are a withdrawal from action. Philosophy is mere metadiscourse. 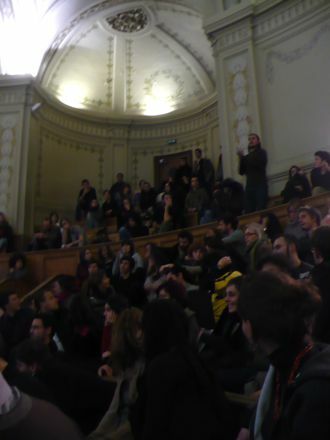 A minute later, someone, perhaps the protestors in the audience, set off firecrackers in the auditorium. Naturally, everyone jumped up out of their seats. (Including me.) We waited anxiously to see what would happen; another little explosion went off, even louder than the first. The crowd became muddled and people started to walk out. The security personnel showed up on the stage and waited outside in force. 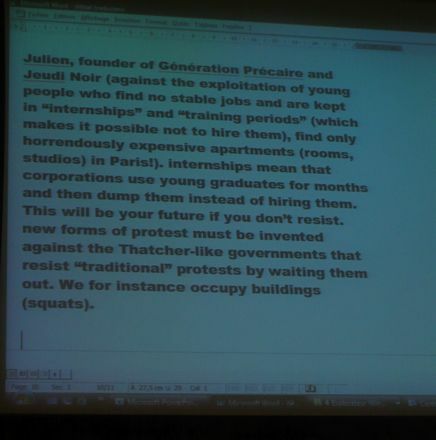 Someone made a half-hearted proposal to “occupy” the Sorbonne but I don’t think it got anywhere. At any rate, I got out of there and went home, not even stopping like a good ethnographer to survey other participants on their reactions. 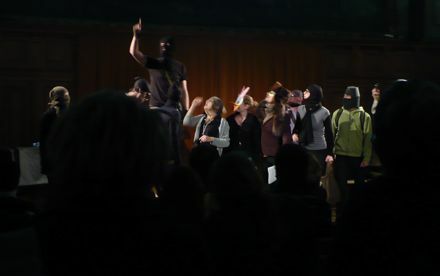 By the photo documentation alone, I would guess that the performers, clad in balaclavas, are making reference to the Zapatistas and Subcommadante Marcos. 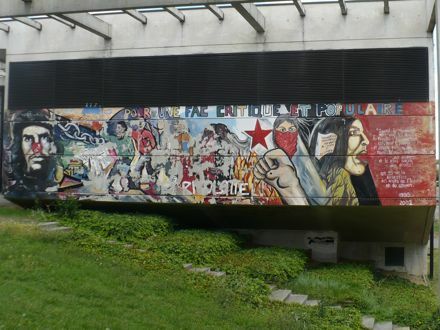 At least within the leftist, more academically-oriented political groups I have come into contact with, Marcos and the Zapatistas have provided the major touchstone and model for alterglobalization movements over the last decade. The “Zapatista Air Force” (really paper airplanes; see http://flag.blackened.net/revolt/mexico/reports/air_mail_jan00.html ) is one of those stories that gets passed around and helps to form the mythology of creating other forms of power. The story you transcribed regarding trying to rub paper together seems to connect with this history of the contemporary radical imagination. A pleasure to hear from you, Nick! Yes, you may be right about the Zapatista imagery, although I wouldn’t guarantee that it was conscious on the actors’ part. Balaclavas are probably susceptible to becoming a deracinated political meme, you know… though that said, when I look back at this post from last summer, it does seem obvious that the Zapatistas were deliberately depicted (see the big mural whose photo is about halfway through the post). It would be really neat to read a history of the circulation of these kinds of radical images — I’ll keep my eye out for one here; there’s plenty of research on french radicalism but I’d need to look more deliberately for work on this kind of internationalist connection. p.s., the Zapatista Air Force is pretty wild! Thanks for the link.